[Link] When Intel asked designers to build a better laptop, its instructions were simple, really. The machine has to be fashionable, able to connect to all manner of wireless networks, and full of the latest, fastest computing capabilities. 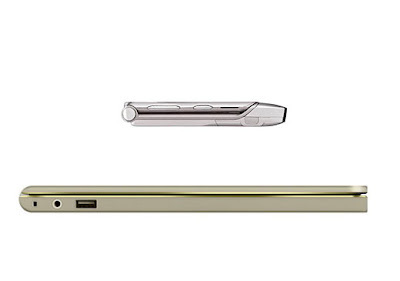 Oh yes, and make it as thin as Motorola’s Razr. Its own engineers in conjunction with Ziba Design in Portland, Ore., rose to the challenge. The result, code-named Intel mobile Metro notebook, is less than 0.7 inches thick—about one-quarter of an inch thicker than Motorola’s (MOT) iconic cell phone, making it the world’s thinnest notebook. And at 2.25 pounds, it’s also one of the lightest small-sized portable computers. Other features include always-on Internet connectivity via various wireless technologies. 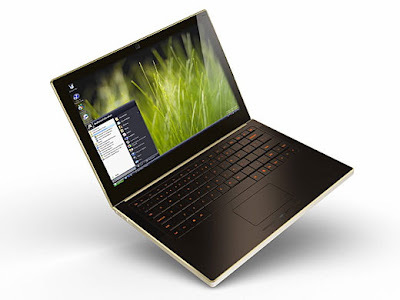 And unlike other computer prototypes, including some from Intel, this one actually may line the shelves of a retailer before long. Intel hasn’t announced an official release date but people familiar with the matter say a PC maker will announce plans to start manufacturing the machine later this year. 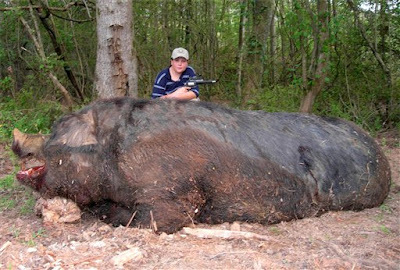 If the claims are accurate, Jamison Stone’s trophy boar would be bigger than Hogzilla, the famed wild hog that grew to seemingly mythical proportions after being killed in south Georgia in 2004. Regardless of the comparison, Jamison is reveling in the attention over his pig, which has a Web site put up by his father—http://www.monsterpig.com —that is generating Internet buzz. Jamison, who killed his first deer at age 5, was hunting with father Mike Stone and two guides in east Alabama on May 3 when he bagged Hogzilla II. He said he shot the huge animal eight times with a .50- caliber revolver and chased it for three hours through hilly woods before finishing it off with a point-blank shot. “I was a little bit scared, a little bit excited,” said Jamison, who just finished the sixth grade on the honor roll at Christian Heritage Academy, a small, private school. His father said that, just to be extra safe, he and the guides had high-powered rifles aimed and ready to fire in case the beast with 5- inch tusks decided to charge. With the pig finally dead in a creek bed on the 2,500-acre Lost Creek Plantation, a commercial hunting preserve in Delta, trees had to be cut down and a backhoe brought in to bring Jamison’s prize out of the woods. Kinder, who didn’t witness the weigh-in, said he was baffled to hear the reported weight of 1,051 pounds because his scale—an old, manual style with sliding weights—only measures to the nearest 10. “I didn’t quite understand that,” he said. “It probably weighed 1,060 pounds. We were just afraid to change it once the story was out,” he said. Mike Stone is having sausage made from the rest of the animal. “We’ll probably get 500 to 700 pounds,” he said. Jamison, meanwhile, has been offered a small part in “The Legend of Hogzilla,” a small-time horror flick based on the tale of the Georgia boar. The movie is holding casting calls with plans to begin filming in Georgia. The Coca-Cola Co., which has been looking to expand its water and energy drink portfolio and jump-start sales in North America, said Friday it has agreed to buy Vitaminwater maker Glaceau in a cash deal valued at $4.1 billion. The world’s largest beverage maker said the agreement to acquire privately held Energy Brands Inc., known as Glaceau, provides Atlanta-based Coca-Cola with a strong platform to grow its “active lifestyle” beverages. The acquisition, Coca-Cola’s largest ever, will be financed with debt, and is expected to add to Coca-Cola’s earnings starting in 2008, but will slightly dilute profits this year, executives said. Coca-Cola’s chief financial officer, Gary Fayard, said in a conference call with analysts that Coke will take full ownership of Glaceau, which for now is 30 percent owned by holdings of India’s Tata Group, a conglomerate with interests spanning steel, software services, hotels, chemicals and insurance. The Tata stake will be acquired later than the majority stake, Fayard said. Tata paid $677 million for the stake last year, a deal that valued the entire company at $2.2 billion, Coca-Cola said. The deal could reduce Coca-Cola’s financial flexibility to buy back its own shares. Coca-Cola had previously said it would buy $2.5 billion to $3 billion of its stock this year; Fayard said Friday the company now expects to repurchase at least $1.75 billion to $2 billion in shares in 2007. Fayard said the company expects cost savings from the deal to develop later, and he added that Coca-Cola will invest those savings in further growth of Glaceau’s brands. The deal to buy Glaceau, which would operate as a separate business unit within Coca-Cola’s North America segment, is expected to close in the summer. It is subject to regulatory review. The boards of both companies have approved the transaction. Glaceau is attractive for Coca-Cola because of its position in the enhanced-water and energy drink categories, which Coca-Cola is betting will make up a large portion of the beverage industry’s growth in North America through 2010. Coca-Cola said Glaceau’s top three executives – founder and CEO J. Darius Bikoff, President Mike Repole and Chief Financial Officer Mike Venuti – intend to lead the business for at least three years, and that other key managers will remain in the business. A spokeswoman for Glaceau, Nina Fiddian-Green, declined to discuss her company’s corporate structure and financial information, and she referred questions to Coca-Cola. Glaceau does not release annual sales figures. Coca-Cola has been trying to improve sales in its key North America unit, which has been a weak spot. The company’s 14 percent increase in first-quarter profit came on a double-digit rise in overall sales, but in North America, unit-case volume declined 3 percent in the quarter.